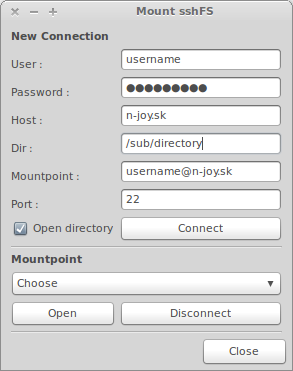 Connecting to a server across the internet is much more secure using SSH. There is a way that you can mount a folder on a remove server using the SSHFS service (based on the SSH File Transfer Protocol). You'll be prompted to save the server key and for your remote password. I found two graphical user interfaces for SSHFS. Download a deb package, that i make for you. I found another GUI application called Gigolo. 1. Install all necessary dependencies listed here. This will install Gigolo and make new deb package, which you can use on another computer. Maybe this is a better choice? this tutorial changed my life. You saved me so many hours, which I can know use for sleeping and etc. Hola!, muchas gracias por el artículo. Me sirvió mucho, ahora que tengo un servidor especifico para desarrollar, me encanta esta opción, para desarrollar en mi laptop directo en mi servidor :) ¡saludos!